This one was just yum with a capital Y. The flavours were superb together, and it was all relatively simple to do. The only thing I have yet to test is whether the beetroot tarte tatin will stand up to being frozen, but I see no reason why not. It can be as simple or as complicated as you like, depending on your time. 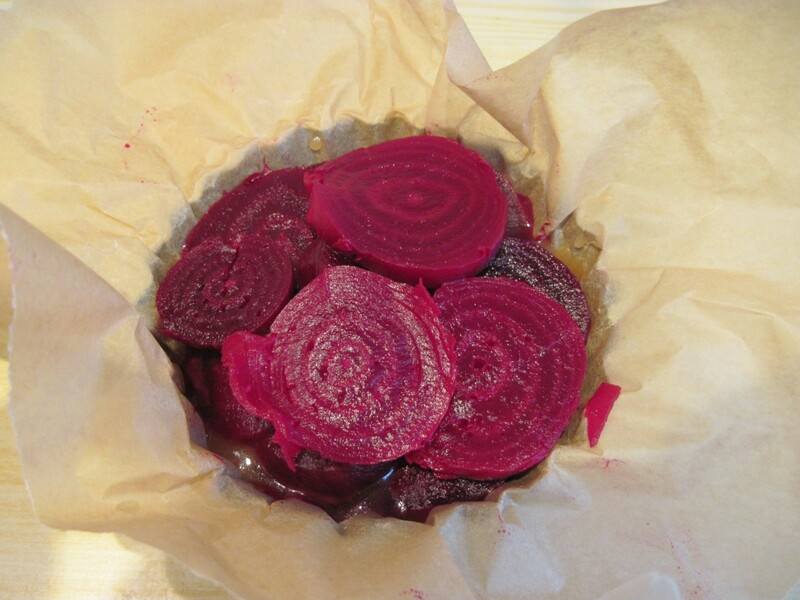 I cooked my own beetroot, but you can just as easily use ready-cooked (not pickled! ), and ready rolled puff pastry makes life a whole lot easier for everyone. Line two miniature loose bottomed flan tins with greaseproof paper, allowing plenty of extra to prevent the caramel leaking out and grease lightly with butter. Melt the butter and add the sugar. Stir until the sugar has dissolved, then add salt, the butter and the vinegar. Continue to cook, stirring continuously until the caramel has gone fairly deep brown. DO NOT ALLOW THE SUGAR TO BURN. Remove from the heat and stir in the honey and thyme leaves. Pour into the prepared tins. Slice the beetroot into fairly fat slices and arrange the circles neatly on the top of the caramel, taking care not to burn your fingers. 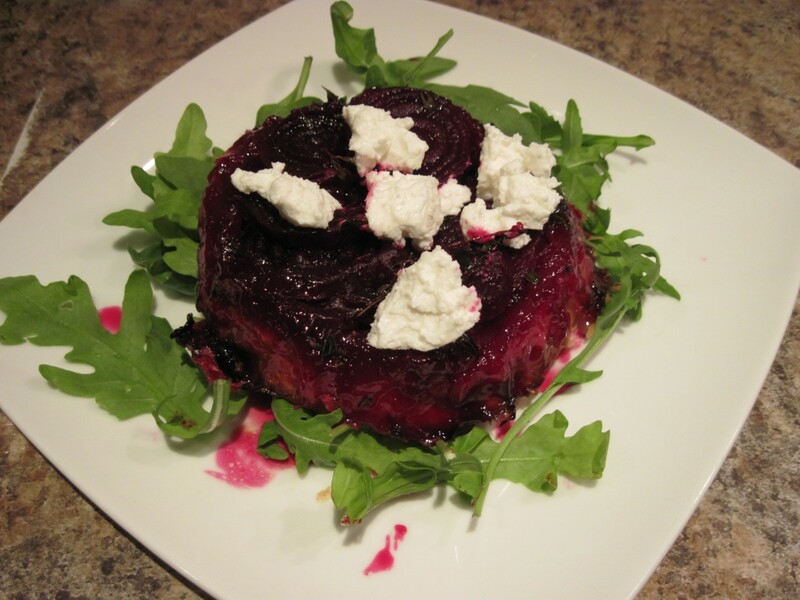 Fill any gaps with odd shapes of beetroot leftovers. Season with salt and pepper. 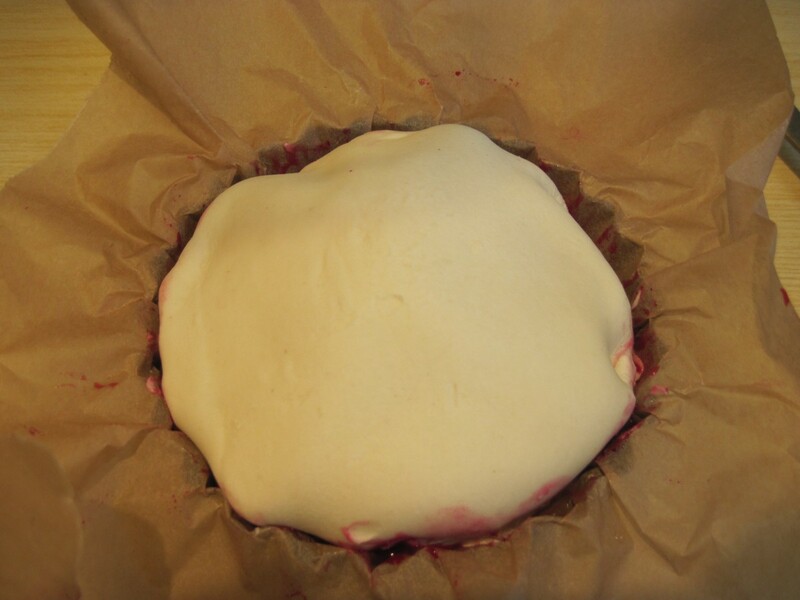 Cut 2 circles of pastry slightly larger than the tins and lay each one over the top of the beetroot, carefully tucking the edges right down inside the edges of the tin using a flat spoon handle. Bake at 180c for 20 minutes or until the pastry is golden and puffy. Allow to cool slightly then invert a plate onto the top of the tin, turn the whole lot over. Allow to stand for a few seconds to let the gloriously pink caramel drain onto the plate and then carefully remove the tin and the greaseproof paper. Wriggle a little rocket under each tart and crumble some goats cheese on the top. Serve warm. Bring the shallot, wine vinegar, lemon juice, zest and white wine to the boil. Continue to boil until the liquid has reduced to 2 tablespoons. Add a tablespoon of ice cold water and return to the boil. Continue to boil until 1 tablespoon of liquid remains. Reduce the heat to low then whisk in the butter one cube at a time and continue to whisk until the sauce is pale and thick. Strain, season and set aside. Reheat gently when needed. (Do not refrigerate – the sauce will separate). 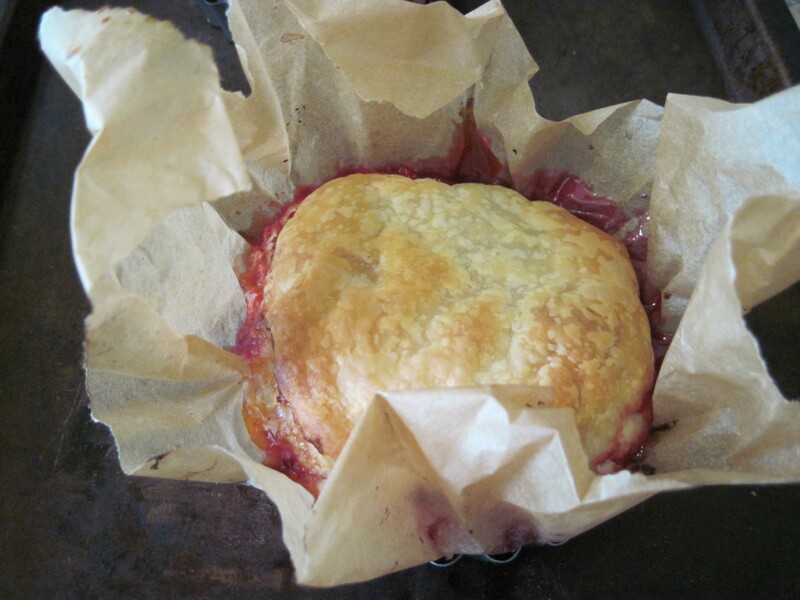 Preheat the oven to 200c, placing a small, deep tin ( I use a pie dish) in to heat up. (If you have an oven-proof frying pan, use that instead). Melt the butter in a small frying pan and wait for it to stop sizzling. Carefully place the potatoes into the pan, and cook until the are golden brown on the underside. Try not to move them around. Season, then turn the potatoes over and slide the contents of the pan carefully into the pre-heated tin so the cooked side remains uppermost. Pour in enough stock to come halfway up the potatoes. Season. Place in the hot oven and leave for about 30 minutes. The potatoes are cooked when a knife can be easily inserted right into the potato. Place a large oven tray in the hot oven. Stir 1 – 2 tablespoons of olive oil through the vegetables, season and spread in a single layer on the hot oven tray. Roast for 20- 30 minutes, turning regularly to prevent burning. As the vegetables begin to appear cooked, keep adding a little stock to keep them sizzling. This also helps pick up all the bits from the bottom of the tray. REMOVE THE BRUISED GARLIC CLOVE. Cover with foil, keep warm. Heat a tablespoon of each of the oil and butter in a frying pan, until it stops foaming. Place the hake in the pan skin side down and fry for approx 1 minute until the sking is crisp and golden brown. Season and carefully turn over, cook for a further minute. Uncover the vegetables and make space in the centre of the tin. Place the hake loins into the space and cook in the oven for around 5-7 minutes (they are cooked when they are firm to the touch). Remove, cover with the foil and rest for 2 minutes. 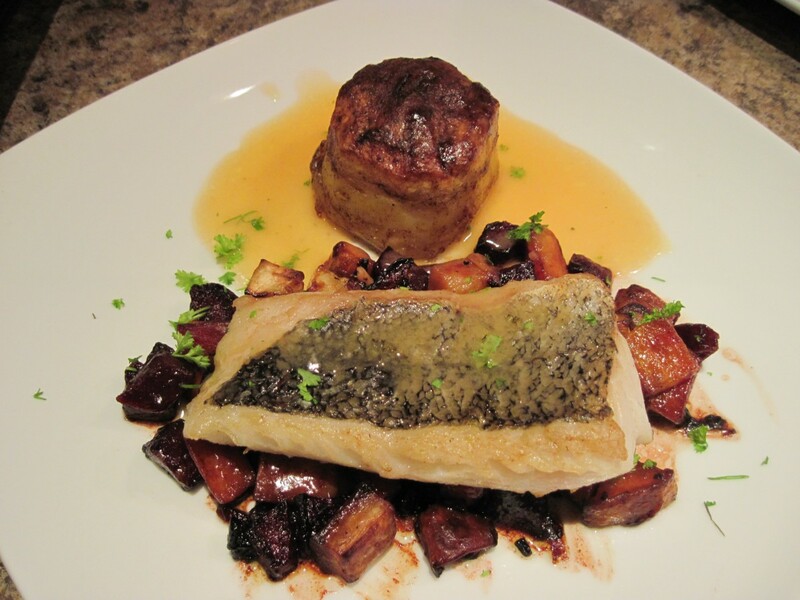 Arrange the winter ratatouille on warm plates and sit the hake loin on the top. Place the fondant potato on the plate and spoon the warm beurre blanc around the potato, with a little drizzled over the fish. Sprinkle with chopped parsley and serve with the remaining beurre blanc in a small jug. 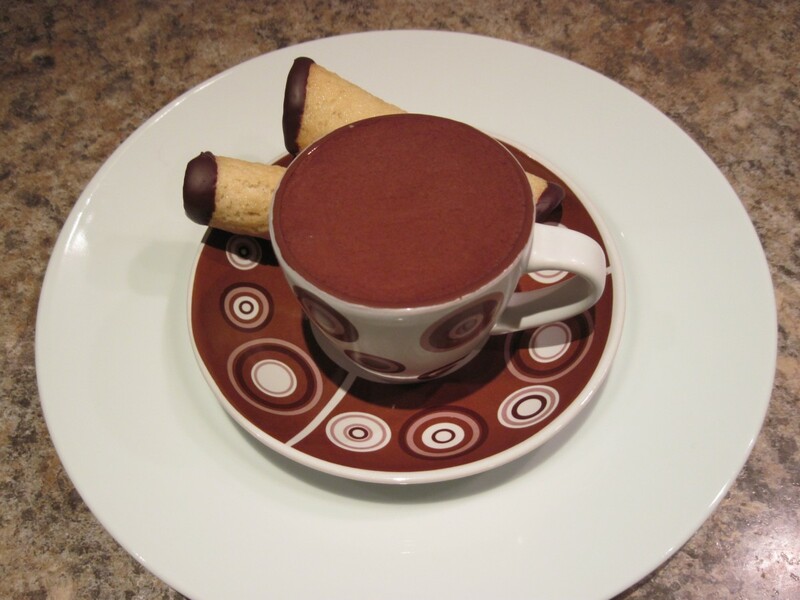 Melt the chocolate and warm water slowly in a bowl over a pan of simmering water. Stir until smooth. Set aside for 2-3 minutes, then stir in the egg yolks. Add the coffee, mix well and set aside. Whisk the egg whites until they are peaking, then add the sugar and whisk again until the mixture is stiff and glossy. Fold a tablespoon of the egg whites into the chocolate mixture (using a large metal spoon) to loosen it up a little, then transfer all the chocolate mix into the egg whites and fold VERY SLOWLY until completely combined. Be gently, or the mousse wont be light and fluffy. Divide between your chosen serving dishes – I used espresso cups, but ramekins or glasses look equally good – and chill until you are ready to serve. Aha! Your Winter Rattywotsit is a root veg one, hence the Winter in the title. I got it now. lol Great idea will do that. :o) Oh excellent Fondant Potato …I love them. Oops….sorry for the silly face there Typo.